The title of this short poetry collection stems from the title of the greater project of which it is a part: the Phantoms of the Past Research project. This project has seen me visit London, Bath, and Bristol in England, as well as the small town of Lucan, Ontario in the past two months, developing a strong appreciation for each city’s history. This collection is composed of poems written at and about sites of memory in each of these cities, and a reflection on each. Within the context of this project’s research-driven sea, my works stand out as a creative island as, in addition to being fueled by history, many of them originated and stand as personal reflections. This project has given me an opportunity to carefully construct works that address a variety of themes, inspiring the self-produced subtitle for this collection: “Exploring Slavery, Sites of Memory, Mortality, and Nature,” as these are the most central concepts to the works I’ve created. Each poem was written with close attention to three aspects: content, an on-page form that suits that content, and a meter and rhythm that similarly echoes the content it explores. This collection explores sites of memory through the first eight pieces, each named after the place they’re written about or an item that dwells there, and attempting to delve into the historical significance of each site, as well as what is forgotten about it. Sites of memory are at the heart of this collection, as it was truly inspiring to be able to stand right where something had happened before, to experience with all senses what each site offered to it’s visitors, as well as what it omitted. Another primary theme of many of these works is slavery, though this theme is not present in the two general poems at the collection’s conclusion. British colonialism and the slave trade in England are often overlooked in history, and so many of these pieces make an effort to bring some attention to issues that still revolve around colonial ties of the past in the present day. This is exemplified by works like “Docklands” and “A Coin in a Shed,” whose spaces are marked strongly by their enslaved pasts. A secondary theme for many of these works is mortality, whether remembered or not. My experience in England brought me to a few different cemeteries, sites that personify the concept of memory. The idea that some people are remembered in their own way is countered by the idea of rows upon rows of people being remembered in the same place all at ones, and so the theme of mortality was something that I thought long about after visiting all of these different spaces in England and in Ontario. This theme comes through in the poems “Bath Abbey” and “A Cemetery (By Beckford’s Tower),” which explore the idea of remembrance after one’s life in depth. The final theme that comes through in a select few works in this collection is nature. In the poem “Newton Park,” I’ve written a line that says “Somebody created landscapes like these / before Wordsworth,” but in truth this line was altered from “Idiots could write Wordsworth here,” something that I believe exhibits beauty and tranquility of the British countryside. Both “Newton Park” and the general piece “Stranded” explore the beauty I witnessed in their lines. As one reads this collection, it is my hope that these four themes are in the back of their mind, as each played a significant role in my approach to this project. pounds of Pounds in their ghostly state. Docklands was the first poem I wrote in England, and is one of the shortest in this collection. The poem is as close to imagism as this collection gets, essentially offering an image of a room in the Docklands Museum in London, England, and leaving little up to interpretation. The museum is housed in what used to be a warehouse where sugar, rum and coffee were stored, but now stands as a space that tells the story of the London docklands. I found inspiration sitting on the top floor of the museum, in the main room, where all sorts of old supplies and machinery from the building were on display. What inspired me, however, was not these items, but the floor they rested on and the ceiling they hang beneath. On the first day of my trip, I was learning the significance of space, and the power it has. The reference to black bricks in the aforementioned lines further ties in the walls of the space, built of black bricks with bits of the original red poking it’s head out from between coal and dust-stained cracks. In certain places, you could see where the wall had been scuffed by people walking by, leaving a wake of red streaks behind them. The poem’s final stanza turns the focus from the ceiling to the floors, where floorboards that were just far enough apart from one another to let the light of the floor below peak through were squeaking a high-pitched symphony. On one display just around the corner from this room, an old treaty referred to black people as “brutes,” something that I incorporated into this final stanza writing “the eyes of men float out / where / the eyes of ‘brute’ turned out.” These lines suggest that what was once a man would likely be transformed into a brute in the eyes of a colonialist if they were threatened the way that most black men would have been in their native countries. Finally, there is a double-entendre at play in the final two lines, as the words “the eyes of ‘brute’ turned out / pounds of Pounds in their ghostly state” suggest that man is transformed to brute under pressure, as was previously mentioned, but also suggesting that these “brutes” were the men who produced “pounds of [British] Pounds” via their labour. I’d like to indicate that, with this being the first poem in the collection, it should act for the reader just as the space it is written about did for me – as a point of reference. The Docklands Museum is a well-preserved space compared to the others I proceeded to explore and write about, and their slavery exhibit was surprisingly detailed with a range of artifacts and displays. The museum, overall, gave a positive impression of remembrance compared to the sites I explored in the week after this space. Upon seeing the Saltford brass mill on the River Avon, I was more taken aback by the natural beauty of the landscape than I was by the building itself. From the exterior, the mill looked to simply be the shell of a building that needed every brick in its structure to stop it from leaning just too far in one way and falling into the stream it hurdles. However, after stepping across a small bridge and into the building itself, the space’s unique and exciting history became the focal point of our visit. In this poem, I hoped to capture the nature of the mill – a neglected structure on a river from the outside, with an exciting history on the inside. The first stanza’s cascading words “it / hardly / stands” are used in an effort to show the exterior’s leaning appearance, and imply the state of disrepair that the building is in. In the second stanza, the fire’s roar and mention of Handel suggest two parts of the mill’s history that I found to be particularly interesting, invoked via auditory imagery. The roaring fire would have occupied a large fireplace used to melt down metals and create brass, however the fireplace is now the charred home of a few birds’ nests and surely a thriving community of insects. The mention of Handel is of particular significance, because it was mentioned that the famed composer may have taken shelter at the mill on a return from Bath during a storm, and became inspired by the rhythmic banging of hammers, resulting in the composition of his piece “The Harmonious Blacksmith.” Noting Handel’s recognition of sound, I shifted the poem’s focus to an image of musical silence that aligns as well with the auditory imagery that precedes it. The third stanza paints an image of the neglected exterior once more. Here, the imagery of the hammers is revived, and the building is characterized as a “clogging” force, slowing the flow of the river and allowing one to “[recall] restriction” of the lives of the people who once manned the hammers in the mill, the restricted discussion of the space’s history, and the many other restrictions the space faces today. The final stanza discusses the space’s present day purpose and remembrance in more detail, citing an “ignored ancestry / [recalled] under [the] foggy breath” of the previously referenced “narrow stream of volunteers” who care for the building today. The lines which I believe exemplify the overall idea of this poem best are “what matters not to most / matters most to these few,” referring to the volunteers who place extraordinary effort and passion into what at first glance appears simply to be a dilapidated frame hovering over the river. All things considered, these are the people who fight tooth and nail to share the building’s story, and this small team is the reason anybody can come to the Saltford brass mill and see beyond a neglected frame. For me, the space allowed me to gain a new perspective on Britain’s role in the manufacture of goods for and from it’s former colonies, having stood where a variety of brass products would have been produced for the colonies and Britain, often with colonial resources. This piece attempts to capture the image of the Newton Park campus of Bath Spa University in Bath. The campus used to be the home to a wealthy family, whose fortunes were all but surely tied to colonialism. The campus’ natural beauty is unforgettable, with rolling green hills, a tranquil pond that acts as the home of a pair of swans, and a sense of isolation that inspires reflection and thought. The beauty of the park and it’s isolation in the hills just outside of Bath is invoked via the natural imagery of the first two stanzas. The hills of the campus are referred to as “rolling vertebrae” that together create the “stretching grassy spines” of the British countryside. The final lines of the first stanza, “[they] compose countryside / and not much else” suggest the sense of isolation one gets when walking through the campus, encouraging reflection and an overall tranquil air. The first stanza’s description of the countryside spills over into the second, where images specific to the campus are invoked – the trees, pond, and the cross of a church that on the day of our visit was hidden in the fog a mile away. By using the word “freckled” in this stanza’s opening line, the anatomical imagery of the first stanza’s spines of grass is echoed in a way, though the metaphor is not meant to continue through along with this anatomical theme. The words “leafless,” “quiet,” “secret,” and “distance” are all chosen to culminate in a sense of isolation once more, in an effort to bring the reader into the mindset one occupies when walking through Newton Park. The third and final stanza expresses a few crucial thoughts to the piece, and my experience in composing this project as a whole. First, the lines “Somebody created landscapes like these / before Wordsworth” summarize a thought that really stuck with me throughout my experiences in England – that all the landscapes I’ve found myself reading and cherishing in Victorian poetry were likely manmade. Writers like Wordsworth, who is used here as the example, place emphasis on nature as being a force that is unparalleled, whose beauty has the power to completely change one’s mood. However, in Newton Park, I first learned that most of the places writers like Wordsworth would have visited were manmade landscapes, and so the images the aforementioned emphasis on nature’s natural beauty is actually misplaced. Thus, the final stanza mentions the fact that somebody else has composed this landscape, like a symphony, with rises (“crescendos”) and falls (“diminuendos”) in the hillside that worked together to create an image that pleased the person who would see them on a daily basis. Furthermore, the image of the “scattered staccato / of melancholy branches” is a reference to the Melancholy Forest in Newton Park, a place where Victorians would come to essentially wallow in their own misfortune. This image is one that therefore provides some comfort to me as a reader of poetry, not because of the misfortune (though this certainly creeps into a sizeable percentage of poetic works), but because it shows that even though it is usually manmade, natural landscapes have the emotional power cited in many Victorian pieces. Bristol’s MShed is a really unique space, celebrating the rich history of a town at the heart of British history. However, for all of England’s involvement in colonialism and the slave trade, there is very little on display to acknowledge the dark side of the town’s history. This poem is written about a coin in the exhibit on slavery at MShed, which is tucked into the back corner of the building’s top floor, rendering it far from the heart of the British history visible at the museum. Though powerful, many believe the exhibit is at best half the size of what it should be, since Bristol was constructed largely on the back of slavery, with many of it’s now celebrated figures owning slaves during their lifetimes. The coin on which the poem is written is shown below, resting in a glass case at the exhibit. The words “AM I NOT A MAN AND A BROTHER,” repeated at many points throughout the poem, hover over the black man who kneels at the coin’s center. “A Coin in a Shed” is one of my favourite poems in this collection, because of the effort I put into the piece’s form and repetition, both of which have symbolic significance. The structure of the first stanza exemplifies the significance of form to the poem, showing a progression from left to right, a bit further after every couplet, mimicking the progress the city believes it has made towards acknowledging the slavery it is built on. However, the cutting, out of pattern line “AM I NOT A MAN AND BROTHER” shows the against-the-grain cries of the black community in Bristol for recognition of the historical significance it has to the city. I noted at MShed that it took me four steps to get between the outer wall of the circular exhibit and the glass display case in the exhibit’s centre (where this coin is housed), a choice I found odd as more could have fit into the space. This empty space is signified by the lines “and so much is not written… that could generously wallpaper / four floating sheds,” implying that this space should be altered to house more that tells Bristol’s story from this perspective. The final stanza of the piece is a response to the question asked by the man kneeling on the coin, and essentially shows the response of MShed and the community in Bristol as a whole to such a question. This response, of course, is a small place to be remembered, and to “feel sterling / meet your kneecaps,” to kneel and to give up the fight to be heard. grey as both may be. Pero’s Bridge is hard to write about, especially when trying to capture the historical tale of the man whose name it bears, for there is very little actually known about it’s namesake. Looking into Pero’s story, you learn his central significance was that he was a slave… but there’s obviously more to a man’s life than just that title. My inability to find that information is at the root of this poem’s complexity, as I am confident in saying that I’m not the only one who has searched for information on Pero and not found it readily available. If we take what is written on the plaque remembering the man, we walk away with a single perspective on a life, one which does not label Pero as anything beyond enslaved. The amount we know about Pero is something that I tried to play with in this piece, right from the start. In the first two stanzas, we see the two time periods that Pero’s life can be divided into. In the first, in his native town, the reader is told immediately to ignore the years Pero spent there, all thirty of them. There is a chance, based on Nevis’ history, that Pero owned land, or fought in battles to resist colonialism, however this is impossible to confirm. Thus, in the second stanza (taking place in Bristol), the reader is told that life for Pero “begins here / though it ends too”, indicating that this is the portion of Pero’s life we choose to recall and acknowledge, his enslaved life. After the first two stanzas, the poem moves into an exploration of the monument on which it is written – Pero’s Bridge, in Bristol. The bridge is at St. Augustine’s Reach, trickling into Bristol’s harbour, and so the year 1999 when the bridge was built over the water of the reach is mentioned in the poem as the time when a life was “immortalized / in metals”. In particular, because there is a plaque at the site that offers some information, one does not necessarily feel that a lot is missing from the story of Pero as it is told by this monument, and so the words “the unfelt absence / of story” are used to imply something absent that will not be missed by most. The final two stanzas offer an image of the bridge and my own interpretation of it’s potential symbolism as a monument, respectively. In the first of these two last two stanzas, the image of the bridge that is presented features subtle indications of forgotten history that revolved around the space. The words “eleven glimmering meters / of forgetful arch” are an indication of the forgotten history of Pero and of the city of Bristol as a whole. Furthermore, the words “six sloshing feet / under noisy footwear” act both as a description of the water below the bridge and a reference to conventional burial standards in which a body must be six feet below the surface. The last stanza offers my own interpretation of the bridge as a fitting monument to somebody who is forgotten although, much like the slavery exhibit at MShed, something much larger should be here in it’s place. My personal opinion is that the bridge, though not astounding, is between two identities as it links Queen Square and Millennium Square, just as Pero’s plaque cannot decide if he was “enslaved” or a “servant” during his time in Bristol. While little is known of Pero, we do know that at some point in his life he was freed, so his identity throughout his life was not just the one he held in Nevis, or the one he held as a slave in Bristol, or the one he held as a “free” man in Bristol. This lack of certainty about Pero’s history, identity, and the fittingness of a bridge as his memorial, is central to the discussion of slavery in Bristol’s history, and I hoped to capture this in my piece. to be navigated via muddy maze. but a heart heard still. where they will be spoken aloud. over and above muted earth. This poem explores the space of Lansdown Cemetery, which sits in the shadow of Beckford’s Tower in the hills above Bath. Two people are referenced in the piece: Ann Ford, and the tower’s namesake, William Beckford. In the cemetery, Ann Ford’s grave and tombstone really stood out to me. Like many others, the cross that once rested atop her tombstone had been knocked off, presumably by wind and years of decay. Her tombstone was barely legible as mold was stretching it’s way up it’s inscription alongside a fleet of different weeds, and it was clear that nobody had been here specifically to visit her grave in decades. Offering a contrasting image, in the center of the graveyard a large plot is carved out of the land in the shape of an oval, a couple of feet above the earth, with a ditch surrounding it like a moat of well fed grass. On top of it is a box, that contains the body of William Beckford. Beckford owned this land, so I suppose it is fitting in a way that he receive a grand memorial, but the fact that so much care had gone into trimming the grass atop his oval of remembrance stuck with me as I wandered the graveyard. The first line of the poem sets a strong start by describing the tower’s shadow as being “littered by graves,” a choice of words used to signify the extent to which the tower overlooks the graveyard with such a powerful presence compared to the graves that seem like dots in comparison. By describing the pathway between the tombstones as a “muddy maze” I hoped to convey an image of the overgrown and difficult-to-navigate nature of the cemetery, which had evidently been tended to at a minimum for quite a while before our visit. The second stanza serves to produce an image of the cemetery’s appearance to the reader. The description of the grass as being rooted in “once-uttered anecdotes” acts both to physically describe the scenery, as the grass is rooted in graves, as well as to characterize the bodies buried there as each being a “once-uttered anecdote.” This characterization views people as living stories and experiences, and implies that the stories once-uttered by these people when they were living were to be uttered only once, rendering their stories unrecoverable now. This line sets up a transition into Ann Ford, whose story I was unable to piece together from the short description on her tombstone. Ann Ford is the subject of the third stanza, in which the action of “stretching” reappears and is applied to her name to give the sense that it has to labour in order to be seen from behind the layers of mold and foliage that have become the face of her tombstone. This stanza contrasts with the fourth, which shifts to focus on Beckford’s memorial, playing with the idea of a heart by using the word’s meaning in a variety of contexts. The lines “Here lies a still heart / but a heart heard still” are used to express the fact that Beckford’s story is prioritized ahead of those around him in the cemetery, with a whole museum dedicated to him inside of the tower that bears his name a short walk away. The poem is ultimately summarized by it’s final lines, reading “Beckford built this lookout / so his story speaks / over and above muted earth.” In these lines, not only is the prioritization of Beckford’s memory exhibited, but so too is the concept of muted stories that are previously defined as composing the earth. and read the same grave fractions. “Bath Abbey” is a departure from the theme of slavery that runs through this collection, focusing instead on the concept of mortality and remembrance. 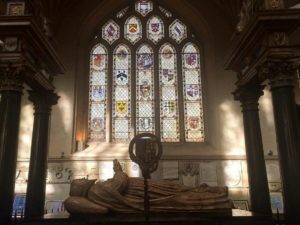 The abbey in Bath’s downtown is beautiful, with stained glass windows that seem to mingle with clouds in their incredible height, remarkable memorials, and countless rows of pews. However, when one looks away from the windows and tall ceiling, the abbey’s floors and parts of the walls contain the names of people who have been forgotten. The first stanza’s description of text that “leaks out” from underneath stone refers to the tombs of people upon which visitors to the abbey step as they walk through the building. Their stories have become faded with the thousands of shoe soles that rub away at the stone on which they are carved each day, leaving as little as two or three words legible in some cases. In others, the text truly “leaks out” from underneath pews and stone structures that have been built on top of their tombs, covering up half of the stone so that only half of their last name can be read. Moving into the third stanza, the beauty of the abbey is referenced, in addition to a focus on the tourists who walk through the aisles of the building in large quantities every single day. The contents of this stanza give a pleasant alternative to the discussion of the floor, allowing the image of the “colourful window panes” to stand out to the reader. The fourth stanza details the memorials of people on the walls of the abbey, one of which I had spent a large amount of time reading, and realized that people had carved away at the memorials to write in their own names. The names and years referenced in this stanza were carved on the memorial of a man and woman, who had requested to be buried together in a nearby cemetery. Censoring the word “G-d” in the second-last line of the piece followed by the word “dammit” is used in an effort to echo my own emotions in reaction to the abbey as a Christian person. The use of these words creates a politeness and formality one traditionally would feel te need to in church via the censorship of “G-d”, with the word “dammit” implying my own disbelief as well as the disrespect that I felt many of those memorialized at the abbey had been victims of. over six feet more of frozen ground. sits on the face’s jawline. with a front row view. This poem is also a departure from the rest of the collection, being the only one written fully in Ontario. This is fitting, given the poem meditates on the graves of two brothers who were key in the creation of the Wilberforce Settlement in Lucan, Ontario. The two graves, essentially joined as one, are isolated in the graveyard, away from the rest, and sit in the shadow of a grey toolshed, next to a garbage can and (upon my visit) a few empty bottles of Diet Pepsi. I realized as I was writing this poem that the way that the people who designed Bath Abbey had prioritized the preservation of the graves that compose it’s floor was much like the way Mother Nature had prioritized the graves of these two brothers. In order to read their names, which were barely legible after the process, layers of dirt, mud, and grass that just seemed to be getting attached to the gravestones had to be pulled away from the two concrete slabs. The land had tilted inwards, like a sheet of paper folded lengthwise, so that the two stones were united by a bridge of melted snow that provided another barrier to learning the story of these two men. This poem’s content, however, pays close attention to everything but the contents of the gravestones, much like the tone itself. The first stanza opens with the image of a dark balloon floating above the township, with the words “black like charred cabins” alluding to the Donnelly Massacre, which took place in Lucan and takes a lot of historical attention away from the Wilberforce Settlement. For this reason, the second stanza places the graves not just within the physical shadow of the toolshed in the graveyard where it is later pinpointed, but also in the shadow of the metaphorical balloon of the town’s history. The third and fourth stanzas of the piece carry on the image of the graveyard as a face, on which the individual tombstones in the cemetery are freckles, and places the toolshed by the two Wilberforce Settlement brothers’ graves on the face’s jawline, indicating their isolation on the perimeter of the site. Furthermore, characterizing the two graves as being a “neglected spot / on the graveyard visage” not only obviously indicates their neglect, but suggests that in the metaphor in which the graveyard is a face, these graves are akin to a pimple. the backrooms of this greying face. to swell with historic ticking. Pry it open, won’t you? a morsel remarkable and forgotten. When I was walking through Bath, I found myself surrounded by old buildings, each of which I’m sure had it’s own unique story. I walked along the River Avon, I had a beer at a local pub with an old friend, and I perused a long list of bookshops on my hunt for poetic treasures. But being in such a hurry to explore and discover the city, I was unable to stop for a minute, breathe, and think about what may have happened in this place before. With an urge to write something, I sat in a café near Bath Abbey and had a cup of tea to achieve unity with British culture, as one must, when I noticed an inscription on the wall across from me. The building I was sitting across from had been standing since 1739, and the Royal National Hospital for Rheumatic Disease had seen breakthroughs in operations across a variety of medical fields, despite it’s focus. Here I was, sitting and reading article after article on the building’s deep history, when I looked up and saw a river of people trickling by the inscription without giving it a second look. This poem uses the analogy of a watch to represent something seen on the face, but never pried open to understand it’s inner workings. For many people, seeing the building (observing the watch face) is all they’ll ever do. For others, they may read the inscription (reading the time of day), and move on with their errands for the day. But for a select few, a rich history lies beyond the walls of the building and deep within it’s history, in the watch’s centre. The first stanza opens with the image of “cobblestone dashes” and “ticking hands twirl[ing] routinely,” with the dashes representing the physical cobblestones on the street in Bath as well as the dashes that mark every five minutes on the face of a watch. The ticking hands in this stanza represent the people, walking “routinely” passed one another. The stanza then proceeds to discuss the innards of the watch, mentioning the cogs that nod as they pass each other, and hinting at the building’s history via the image of the first nurse in Bath, who works the muscles of her patient. The second stanza opens with the play on words of “the ticks talk not,” signifying that the people (the ticking hands of the watch) do not speak to each other or discuss what they pass by at all, while simultaneously playing with the “tick tock” sound of a clock. Their passing of each other “in perfect rhythm” also bears significance, reflecting the phrase “like clockwork,” an idiom used to describe perfection and precision. The second stanza also describes the inscription on the outer wall of the building as a “faded pimple on the concrete face / that is the sole mention / of the cogs behind it,” accurately indicating that the memorial inscription on the building has worn away with time. The third stanza summarizes the overall message of the poem, as well as the metaphor at play throughout the piece. The historical cogs that compose the inside of the watch are here described as making the hands of the watch tick, indicating that history is the reason that the watch’s “hands [waltz] on cobblestone wristwear.” Though history is what created Bath, the reason the city exists and indeed the reason that many of the people there are able to call the city home, they pay little attention (as I did in my walks) to the rich history of the town. The final stanza urges the reader to go beyond the face of the metaphorical watch, to “pry it open” so that within the cogs of history they may find “a morsel remarkable and forgotten,” they may find something truly amazing, as I did when reading about this forgotten hospital. touring a tired town in lazy time. through the sun’s peachy glow. and the sky is all purple pink loose strands. purple pink loose strands on blue. I wrote “Stranded” looking down upon the River Avon, which flows through Bath, just past Pulteney Bridge. From where I stood, the hills in the distance were bathing in the “purple pink loose strands” described in the poem, reflected over the water. After a week of rainy weather in the country, England had opened its skies and shown something remarkable, and I felt just as Wordsworth must have when he wrote his works. This poem explores nature, that is essentially it. There is not a lot in this poem to read into, and there is no deep poetic meaning, it is rather an image of a place to stand, reflect, and be tranquil just beyond a landmark in the town. The goal of this poem was to convey the feeling I had standing there and then to the reader – a care free and content belief that though later I would leave the space and miss that moment, in that exact span of time that I stood above the river with no concerns. The poem’s common refrain “the sky is all purple pink loose strands” repeats itself so frequently because it was an image I could not shake as I stood and wrote this piece. No matter what I noted around me (the cold air noted in the third stanza, the people in their homes across the river from the fifth stanza, etc.) my eyes would end up on the clouds again, forming thin lines that picked up the purple and pink light of the sky. The image of “depression like a hunting dog” chases the reader, as if it is a force that will inevitably make it’s presence known, but the sun as it fades provides protection from the dog, mitigating the threat it poses at that exact moment. The understanding that as the sun sets that metaphorical dog may come back is communicated in the second to last stanza, as the sun “tows on shadowy leash / a familiar bark,” but the next stanza provides a reminder that this is a special moment, and the concern is forgotten. The final couplet of the poem provides a return to the image of a purple and pink sky over the Avon, but also provides a near rhyme to the last line of the preceding stanza, creating a safe and comfortable response to the threat of the dog that is implied within that stanza. Though it does not concern itself with heavy themes, history, or other themes that flow commonly through this collection, “Stranded” is included here because it details an experience that I never would have had without working on the collection it is now a part of.